This RP is closed for now! Later on, we can post the artwork as well! The only child of the Sexton of the Pokémon Tower in Lavender Town, Vierre had a relatively quiet childhood. Ghost and Dark Pokémon were familiar to her, but she had trouble truly making friends with them. On her 8th birthday, she stumbled upon an abandoned Cleffa in the woods outside of town and the two grew inseparable. As she began attending school in Saffron City, Vierre fell in love with Fairy-type Pokémon, finding fascination and relief in the brighter, fantastic world they promised, in stark contrast to her Lavender Town upbringing. She began her Pokémon journey and as she progressed, she came to a realization that the Ghost and Dark types she grew up around were powerful and beautiful in their own right and found herself with a close team of Fairy, Dark, Ghost and Psychic Pokémon. Upon defeating the Elite Four, Vierre chose instead to work at the Viridian City Gym, hoping one day to fulfiil the promise she made to her Celadon City University friends - to become a Gym Leader and to one day claim a spot in the Elite Four. Last edited by Eri on Thu Sep 06, 2018 1:01 am, edited 2 times in total. Cecily has always been the friendly girl-next-door, even though her father's job often had her family moving often. Her father was a researcher, though he was never very good at explaining exactly what he was researching. Cecily embraced the changes, though, with a smile before venturing off to make new friends. When she reached high school, her father finally settled into a stable job in Celadon City. There she was able to finally grow into her own, and even fell into a standard teenage love story with a boy: Riot. Even defying odds, they stayed together into university; until a tragic confrontation with Team Rocket tore them irreparably apart. 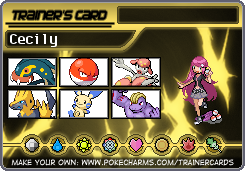 After the break up, Cecily moved back to Vermillion City, training with the Electric gym leader until he handed her the keys so he could set off in his travels to Alolan. She had dreams of moving on from Kanto eventually, but something seemed to be holding her back; keeping her not only in the region, but not too far outside of Vermillion City. Last edited by Lexi on Thu Sep 06, 2018 9:21 am, edited 2 times in total. Hiroto grew up in Lavender Town, the son of a baker and a Pokemon Center engineer. He was cared for and loved, and he knew nothing but happiness for 11 years. His dad, who was once a trainer, sent him to school with bread in different shapes in an edible version of Who's that Pokemon? He spent his afternoons in the Center with his mother, who showed him the dazzling technology behind the beep-boop of the healing station. Unbeknownst to him, his parents had been drifting apart. A week after his 11th birthday, his parents told him that they were taking some time off. Hiroto knew what that meant. It was nothing new in this social climate. Yet, he tried to keep his parents together. Acting out at school only ignited sparks in the marital spat. Each parent would blame his bad behavior on the other's upbringing--the daily pastries were responsible for his lack of self-control and his uncontrollable drive for instant gratification, while the daily visits to the Pokemon Center machinery resulted in his aloofness and his general disposition towards Pokemon as mere items. The night after a parent-teacher conference was called due to the fact that he pushed a classmate off a swing, his parents were arguing in the other room, with restraint--their voices low and steady perhaps to avoid waking the young Hiroto--but he could still understand the raging undercurrent of spite between them. He snuck out to ignore the fight and he soon found himself beside an oak tree by the edge of a park. Alone, he crumbled into tears. A curious Elgyem approached Hero. With its inquiring eyes of gem gleaming in a soft green, it appeared almost tearful to him. His rare episode of vulnerability endeared the Elgyem to him, too, and he befriended the strange Pokemon that night. After his rebellious phase, he moved in the other direction, turning into the class valedictorian almost overnight. It seemed to bring a transient peace to their dinners as both parents listened every day to his list of achievements in school. He felt that their attention on him meant that they would lose interest in their own disputes. As he toiled in silence while keeping a tough exterior for his parents and his peers, his Elgyem was his only true confidant in the recesses of his mind. He worked tirelessly to keep this truce going, but he was tired. So were his parents. At 23, after he graduated college, his parents said that they had divorced. He never cried again after meeting his Elgyem; he didn't have to, though he was breaking inside. He developed an affinity for Psychic Pokemon, who always knew how he felt without his having to lose the facade of the young, brave hero. Riot Forrester was born in what could only be described as a perfectly ordinary family. His father Simon was a middle-class working man that spent his days as a producer in a Pokémon talkshow, and his mother Gina worked at the shopping mall downtown, helping the owner in managing the perfume boutique on the first floor. Both parents spent their days earning their pay, and were home early enough to organize a family dinner every night. The youngest of four, Riot learned how to adapt to a chaotic life early on. His two elder brothers Order and Anarchy (who were twins), frequently seemed to forget about him - although not in a way that was will ill-intent, but one resulting simply from circumstance. Riot’s older sister Charity (the eldest of the Forrester children) was always bringing friends home, and she was always one of the popular girls at school. Naturally, their house was constantly buzzing with activity. As a toddler and through his early years, Riot’s curious nature allowed him to excel in his studies, and through his outdoor activities in the afternoons he eventually learned that he preferred to spend his time in the gardens by his building with his neighbor and close friend Enman. The building where he lived was on the nicer side of Celadon city, and it had vast and beautiful garden whose many walkways all led downtown to the shopping district. The gardens were huge by anybody’s standards, and it was not uncommon for even adults to lose their way in the midst of it’s many routes. It was in these gardens that Riot met his first Pokémon, a Tangela that had gotten one of its vines tangled in a bush. After Riot helped the young and abandoned Tangela, they were simply inseparable. Throughout his time in elementary school, Riot was widely regarded as a grass Pokemon enthusiast, spending virtually all of his free time in the gardens of the city, which was teeming with them. One lucky afternoon, after he’d gathered enough money to buy his first set of Pokéballs, he battled and caught his first Pokemon - and Oddish with an attitude. Riot quickly became involved in Pokémon training, and by the time he reached middle school he was becoming one of Celadon’s up-and-coming young talents. Early in his high school career, Riot met Cecily, and the two immediately hit it off. They met each other on a Monday, were smitten with each other that same afternoon, and were the talk of the entire school by the end of the week. They were together and inseparable even throughout their college careers. After a deadly incident with Team Rocket, Riot and Cecily split. After seeking comfort in his close friend Enman, Riot decided to return to Celadon City, having already completed the Kanto Gym Challenge and defeated the Elite Four. Almost instantly after his return home, Riot was asked to be the new Celadon City Gym Leader, and he has been battling ever since. Gym Status: Top Member - Current Gym Leader seeing through final Gym renovations before handing over the keys. Though born under the blazing Alolan sun, Donnie Kaʻaukai grew up in Viridian City after his family moved to the Kanto region to start a new life. He remembers very little of the change, and took to life in his new hometown like a psyduck to water. Or, rather, he forced the town to take to him. Viridian City always seemed too small for the feisty, brash Donnie. Brimming with life and enthusiasm, it was clear from a young age that he was a small-town boy with big dreams. 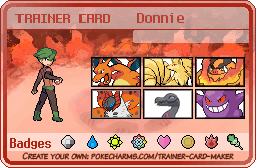 Donnie was always surrounded by friends, but his popularity rocketed near the end of primary school when he befriended -- of all things -- a mischievous Gengar. He had been walking home late at night from a friend's house when he noticed his shadow wasn't acting quite how a shadow should. Perhaps it was his brazen laughter in the face of danger or the outstretched hand he offered the Gengar, but the connection between Pokemon and would-be trainer was almost instantaneous. He impressed adults and children alike upon reveal, and very few people wanted to make enemies with a spiteful boy and his spiteful ghost. As Donnie’s popularity grew, so did his ego. Though he genuinely cares for his close friends, he is awfully inconsiderate of other people's feelings. Fire came later in Donnie's life, and when it did, it shook him to his core. It was during his first year of highschool when he first witnessed the most spectacular display of….well, firepower, from a passing trainer. The team possessed captivating beauty and strength; their flames searing themselves in Donnie's mind forever. From then on the boy knew that no matter what he did, no matter where he went, he wanted to leave behind the same lasting impression. Now his dream rests tantalizingly at his fingertips. He works relentlessly at the relocated Cinnibar gym, giving it his all to come out on top and make his name known throughout all of Kanto. Enman’s father was a career pokemon trainer aspiring to take the Champion’s spot over the elite four, but he vanished during a sudden storm while training at the Lake of Rage. Enman’s mother came from a long line of dragon trainers, but chose to leave that life behind after finding herself widowed with a newborn baby. She took her infant and moved to Celadon City, getting herself a job in the iconic Celadon City Department Store. Outwardly, she discouraged the life of a pokemon trainer, while secretly supplementing her income with private battles. Despite her disdain for trainers, or perhaps because of it, Enman grew up enamoured with the idea of having his own pokemon adventure. His childhood was not an unhappy one. His mother provided for all of his needs to the best of her ability, but her attitude toward his desire of being a pokemon trainer lead Enman to believe that she thought he wasn't strong or skilled enough. This developed into a feeling of inadequacy that Enman would nurse the rest of his life. Enman's best friend was a neighborhood boy of similar age named Riot. They often played in the gardens outside of Riot's home, and the two became incredibly close. Riot was the one who gave Enman his first pokemon, a magikarp, which he caught and smuggled into Enman's building as a birthday gift. Overtime, however, Enman’s admiration for Riot turned into envy, and their childhood competitions morphed into an obsessive need to beat Riot, to prove himself better than his friend. 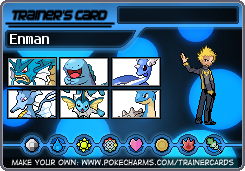 This obsession would become Enman’s primary driving force in life, all the way up to his career as a gym leader, which he struggled for only after learning that Riot had taken the lead of Celadon City’s home gym. It would also lead to a deeply rooted bitterness, which began to grow as the boys reached their teens. Riot branched out in his social circles while Enman, jealously feeling like he was being left behind, withdrew and became more reclusive. Matters only got worse when Riot began to date a young trainer named Cecily. Enman's pokemon experience truely began shortly after he turned thirteen. His mother, despite recognizing the power Enman’s magikarp could eventually transform to wield, allowed Enman to keep his pet. She believed that his fondness for the pokemon, and his inexperience, would prevent him from ever coaxing the magikarp’s potential to the surface. But it was Enman's quiet rage, rather than his skill, that fed into the pokemon and eventually brought forth it's evolution. The resulting gyarados exploded from the bathtub that Enman had been letting it flop around in, and collapsed part of the interior of his mother's apartment. Enman’s mother, understandably startled by the sudden destruction, started to battle the monstrous pokemon, but her son stopped her. Though Enman had nowhere near the skill or willpower to subdue the twenty foot sea dragon, they found a mutual understanding in each other's anger. When Enman commanded the gyarados to return to its pokeball, the creature did not resist. Afterwards, once their apartment was repaired, Enman began journeying to nearby towns and cities, sometimes with Riot, but mostly alone. He did not attend the university at Celadon like his friend, choosing instead to travel and gain experience. He eventually found his way into the Johto region, and to the Lake of Rage, where his father vanished. He spent a year living, and learning from, his mother's family before returning to Kanto. He followed in the footsteps of his friend Riot, beating the region's gym challenge, and taking up a position with Cerulean City’s Water Gym. There he would eventually be offered leadership of the gym.